Another beauty! Very sensitive writing about PTSD and love. Kait never lets her readers down. 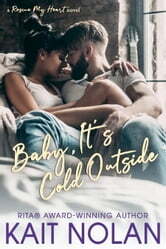 i love the way this novella starts out so quietly then speeds into to the storm that traps two people who want to be alone that leads into attraction and eventually into stronger emotion then a major let down only to find out the they both misunderstood what had happen .. and finally into a happy ever after. The story line was awesome and I loved Ivy and Harrison personalities. I enjoyed it from first page to the last. But then is Kait, you can always count on excellent delivery.